How much does it cost to travel Europe by bicycle? This week I turned my attention to what this lunatic ‘gap year’ idea was going to cost us. I mentioned the idea of creating a budget to the Husband and he very quickly left the room. By way of explanation, he is afflicted with the not-so-rare male condition known as ‘formaphobia’. The syndrome manifests itself in a fear of forms and Excel spreadsheets, and is particularly acute when the words ‘tax’ or ‘financial’ are mentioned. Symptoms include: getting irrationally angry, becoming periodically hard of hearing and demonstrating a sudden nesting instinct with extreme busyness on other tasks. So it looked like this was going to be a one woman job. I rolled up my sleeves and created a proper spreadsheet with variables such as ‘exchange rate’ and ‘number of weeks traveling’ so that changes could be made in a single cell and the repercussions would be instantly displayed throughout the spreadsheet. The numbers very quickly got scarily high but right at the beginning, when this hair-brained idea crystalised, we mentally set aside a ballpark figure over which we are reticent to go. This amount is the cost of a new 4 wheel drive vehicle. We noticed that several couples that we know in our age bracket and position have recently bought expensive vehicles of some description. We thought we would follow the trend and, being cyclopolitans and car-free, we decided to buy a ‘virtual’ 4×4 and spend the money on a gap year instead. I had no idea how much one of these beasts would cost but after doing a bit of research on the web, I reckon we’re good for about $40-50k. A virtual 4×4 also has the financial advantage of not requiring petrol, tax, WOF, maintenance, tyres etc. so I would highly recommend a virtual 4×4 over the ‘hard to park’ reality. “So what is it going to cost?” I hear you ask. Well, bearing in mind that this is just outgoings and I haven’t included any potential work income while we are away and the income from renting out our apartment, the outgoings look something like this. These figures are for two of us together. 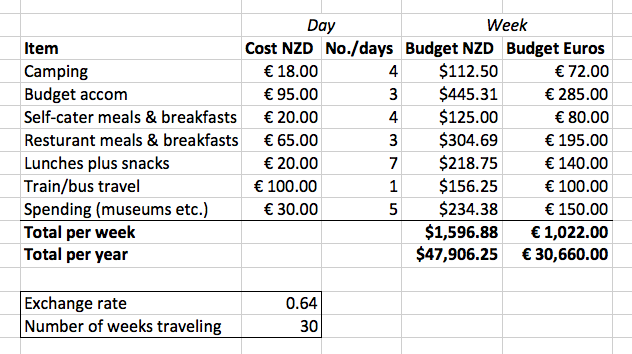 They are also very approximate estimates as we are unlikely to split the week neatly into budget accommodation and camping as I have done here. I anticipate that when we are in towns and cities we will stay every night in budget accommodation and when we are in the country we will mostly camp but I am hoping that this will roughly equate to a 3:4 split in the long run. I read on the web that you should allow the same cost for food as you have allowed for accommodation because you generally eat in restaurants, which is relatively expensive, when staying in hotels and cook your food fairly cheaply when camping. The figure allowed for travel on trains and buses is a complete guesstimate, as is the amount allowed for spending on things like museum entrance fees. I would like to keep the cost much lower than this obviously but as the old saying goes – ‘plan for the worst and hope for the best’. I find it particularly strange that when you cluster up the related costs we seem to be spending more on food than we are on accommodation. Does this seem correct to you? $650 a week sounds like an awful lot of money to feed two people – even if they are cycling. But hey, we will see what happens. The spending allowance also seems quite high but we decided early on that we are not going to miss out on seeing the Berlin orchestra or visiting the Sistine chapel, for example, because it is too expensive. I’m sorry if this post has been particularly dry and apologies to anyone who suffers from formaphobia … but sometimes you just have to face up to the pile of spinach hiding under your fork! Why buy a 4×4 Remuera Tractor when a perfectly good second hand sedan will see you right? Hi Christopher – I have to admit that you have confused me here. Just to clarify, we are not intending to buy a vehicle – only use it as a financial metric for the trip. have you considered joining warmshowers.org? I’ve found it a great way to meet locals, share biking stories, and reduce travelling costs. Also, once you get back to NZ you get to host. We recently hosted Thorsten and Maren from Koln. They spent the past 2 years cycling from Macedonia to Wellington. They spent Euro400 each per month. Thanks Patrick, that is very helpful! I will definitely check out that link. My girlfriend and I recently did a long cycling trip including around 3 months through Europe. In Western Europe we spent around 50euro per day for the two of us. In Eastern Europe we aimed for 50nzd per day for the two of us. We used warmshowers.org and couchsurfing.com when we could, freecamped sometimes (it’s more or less acceptable – a guy in a french tourist info place even told us to! ), and stayed in hotels sometimes. Those numbers don’t count plane tickets to get there, the bikes themselves, or insurance. We ate out probably once a day on average, maybe slightly less often. “Hotel picnics” are a good way to save money when staying in hotels, and you can build quite good meals out of cold ingredients from supermarkets.